Commercial exterior maintenance is key in creating an inviting environment for customers. The outward appearance and accessibility of retail stores, restaurants and banks visually communicates value to consumers. To keep facilities safe and in excellent condition, property managers need an exterior maintenance strategy that allows them to react to maintenance issues efficiently and effectively. At SMS Assist, we understand the importance of robust exterior maintenance strategies. Our technology simplifies exterior maintenance by providing real-time service validation, consistent quality control and lasting first impressions for your customers. 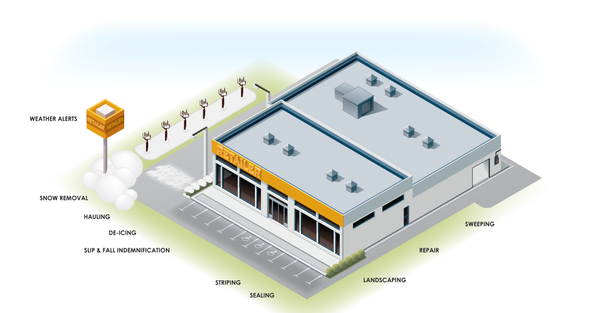 Proper exterior maintenance of commercial buildings allows you to proactively eliminate maintenance issues while creating better customer experiences and improving the bottom line by drawing more customers to store locations. When several inches of snow needs to be plowed or parking lots need to be resealed, you need knowledgeable, reliable professionals that are equipped to handle and manage maintenance responsibilities. At SMS Assist, we’re dedicated to simplifying and optimizing commercial property management responsibilities. Our proprietary platform, One by SMS Assist, gives you access to contractors (known in our network as Affiliates), a team of subject-matter experts and operations specialists to ensure the job is done right. Our technology and unique business model eliminate unnecessary work order requests and back-office costs like invoice processing, resulting in long-term savings. One by SMS Assist provides actionable reporting and analytics, giving you the information you need to adjust your maintenance strategy. You have complete, real-time visibility into spend, quality assurance and service verification. SMS Assist’s indemnification is backed by $50 million in insurance, which helps manage the risk of maintaining each facility and provides our clients with peace of mind. An in-house team of operations specialists ensure the most knowledgeable, reliable professionals are dispatched to your locations. We manage your maintenance operation from work order creation to vendor payment, allowing you to focus on serving customers whenever issues arise 365 days a year. We empower clients with commercial facilities maintenance capabilities that deliver value and help them effectively use their facilities maintenance budget. Upgrade your commercial exterior maintenance capabilities.